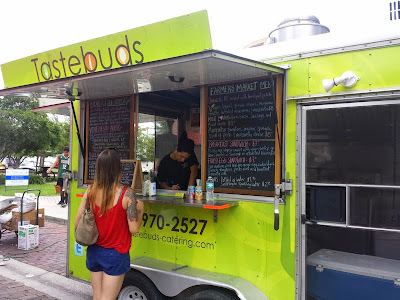 I visited the Winter Park Farmers Market on a recent Saturday and decided to get some lunch from a food truck called Tastebuds Catering. Even though it was lunch time, I decided to get a second breakfast instead. 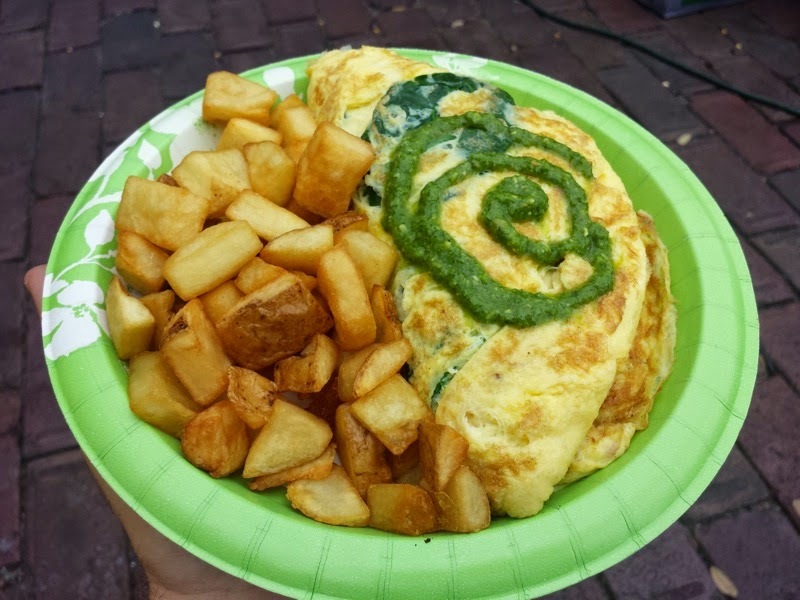 I ordered the Margarita Omelet. It was filled with tomatoes, organic spinach, mozzarella cheese, and was topped with pesto. Potatoes were served on the side. The omelet was tasty, although it did seem a little lopsided when it came to the cheese. One end of the omelet had plenty of mozzarella, while the other end lacked the cheese. Other than the cheese thing, I liked the omelet. There was plenty of spinach and tomatoes and the pesto was a nice touch. The potatoes were forgettable. I was invited to try a new Italian restaurant called Spoleto. They are located across the street from UCF in a very new shopping center at the corner of University and Alafaya. 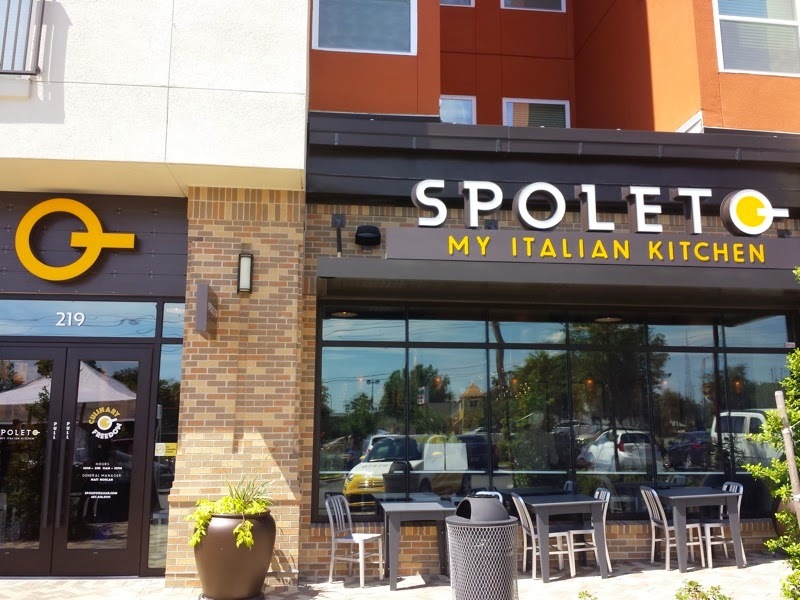 This is Spoleto's first location in the United States, with two more stores opening soon in Winter Park and the Florida Mall. They are already a good sized chain with over 380 locations in Brazil, Mexico, and Costa Rica. I always find it interesting when an international restaurant chain chooses Central Florida as its stepping off point into the US market. I wonder how much market research went into deciding that UCF would be the ideal spot to begin expanding into this country? 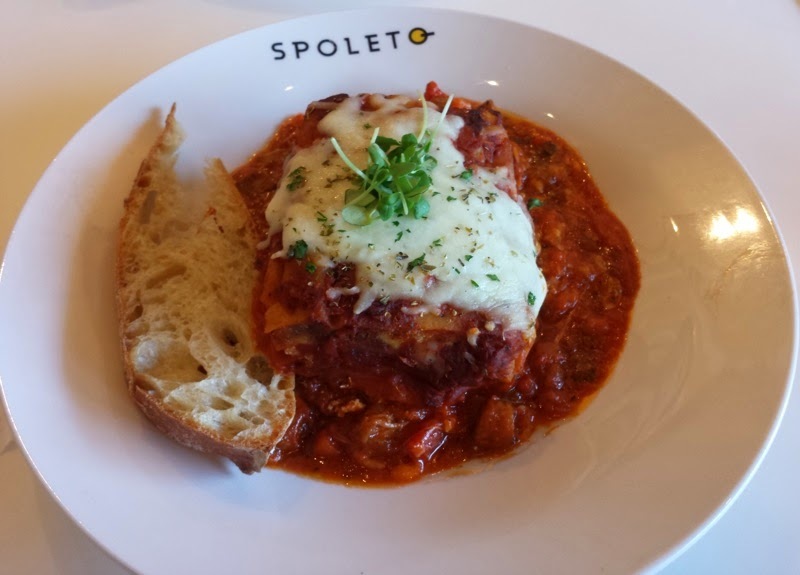 Spoleto is a quick service style restaurant. 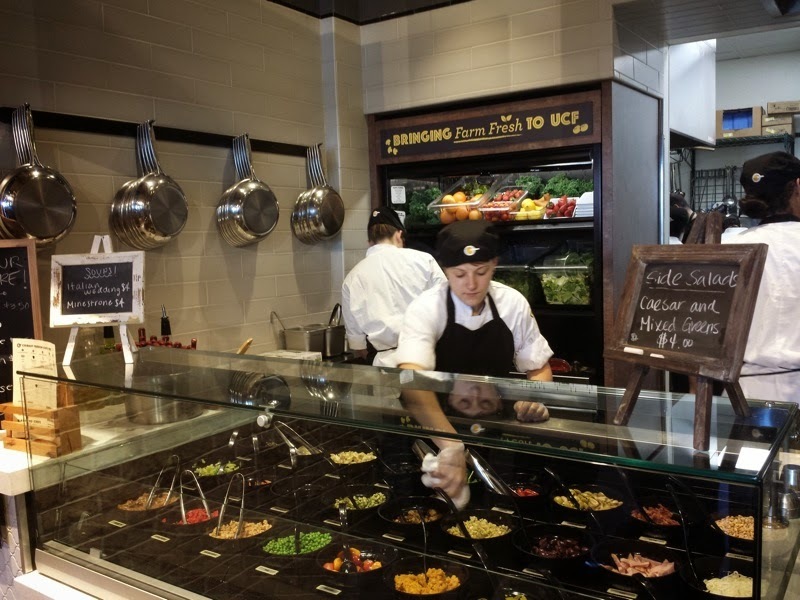 You go up to the counter and pick your pasta, sauce, meats, and toppings. Everything was then tossed and cooked together by a chef, and then you pay and bring your food to a table to eat. The same thing goes for flatbreads, salads, or desserts. I ordered the Potato Gnocchi in pesto with spinach, sundried tomatoes, caramelized onions, kalamata olives, roasted garlic, and an Italian cheese blend. All this was topped with a house-made giant meatball. It seems like restaurants like this find the need to yell something as something happens. At some places you get a "Welcome to Blank" as you enter. Other places get you bad singing if you leave a tip. 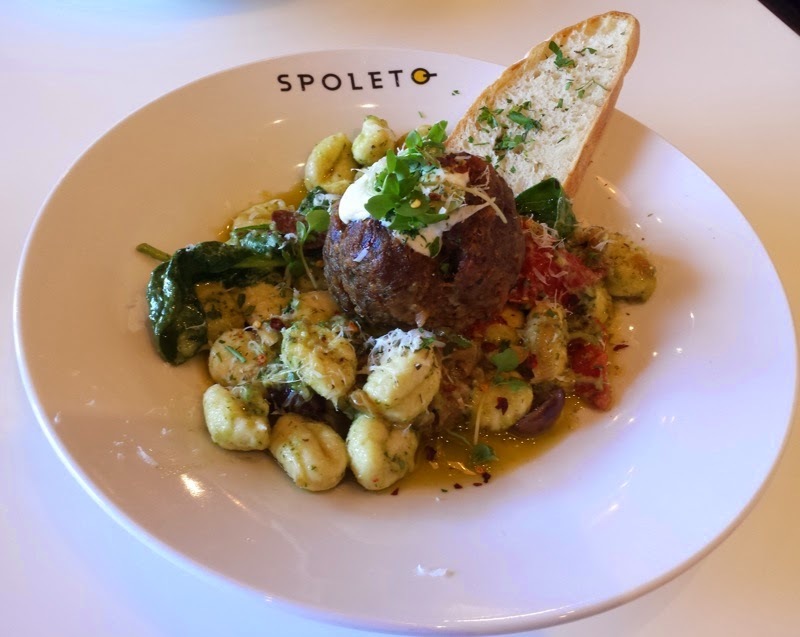 At Spoleto, the entire kitchen would yell out "Polpette Grande" whenever a meatball was ordered. I enjoyed my gnocci! I also tried the Artichoke and Goat Cheese Focaccia. 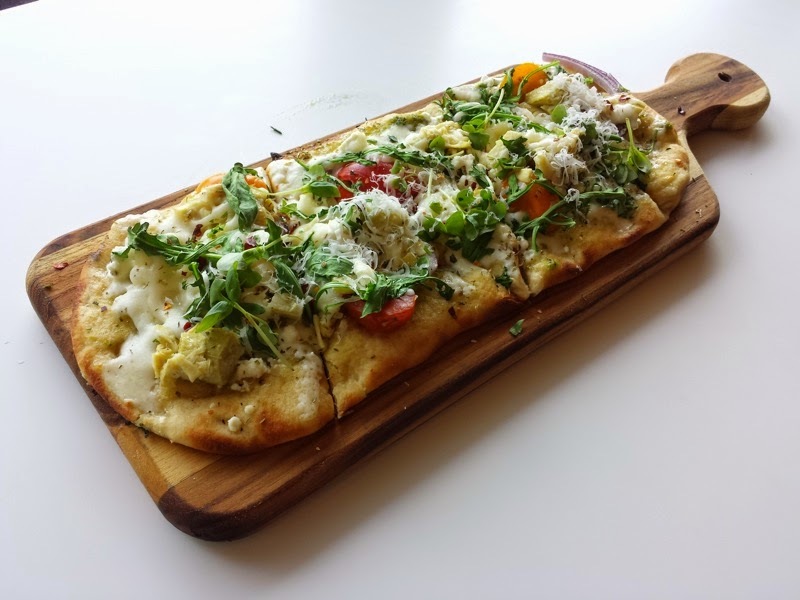 This flatbread was topped with artichoke hearts, tomatoes, red onions, mozzarella, goat cheese, and B&W Farms baby arugula. I tried the Nutella Bread with fresh strawberries for dessert. 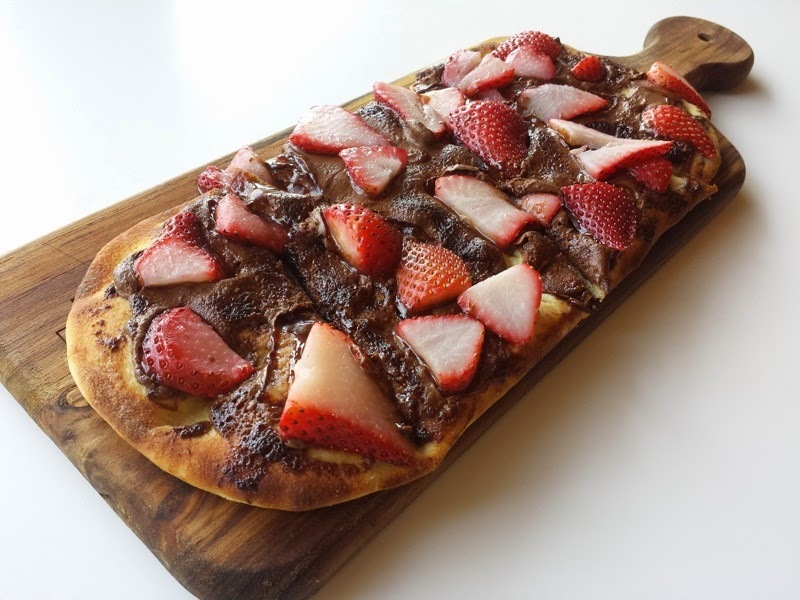 Nutella and fruit is delicious, but an entire flatbread of Nutella was overwhelming. Spoleto was an enjoyable dining experience. I found it to be a notch above some other of the fast food Italian restaurants that have opened recently in the Orlando area, so that's a good sign for them.